Spring has sprung and in celebration of April being Earth Month, I thought I would focus on a recipe with fresh-from-the-earth vegetables. 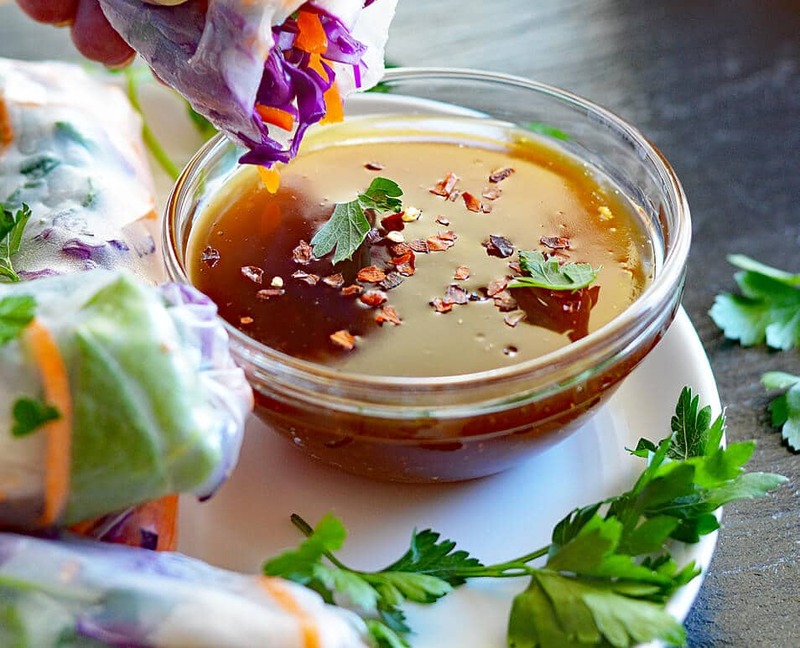 One that requires very little prep and even less cooking time is my Vegetable Spring Rolls with Peach Dipping Sauce. 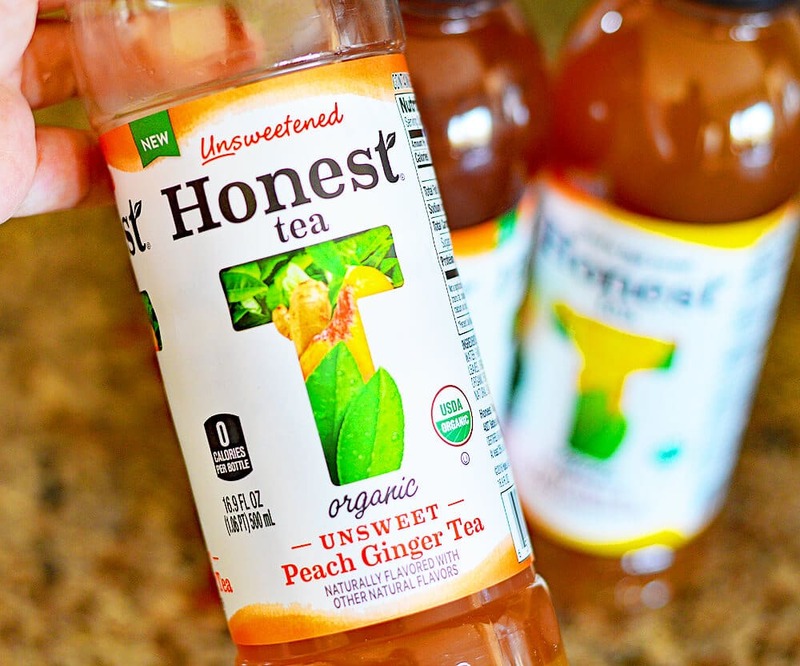 I’m using Honest® Tea’s NEW Organic Unsweetened Peach Ginger Tea made with brewed organic black tea and honeybush leaves, a touch of peach puree, and a kick of ginger flavor! 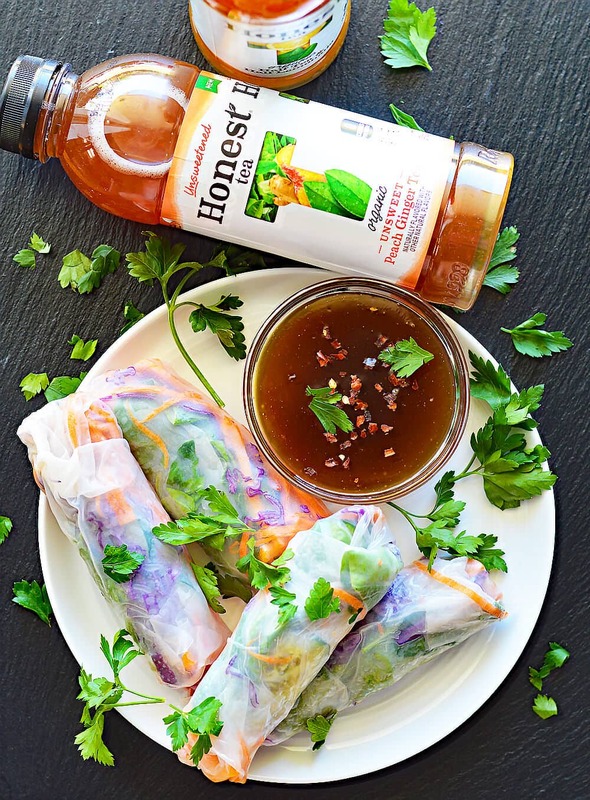 You’ll need one 16.9oz single bottle of the Peach Ginger Tea to make the sauce for this recipe, but I also served my dish with a variety of the Honest® Teas. 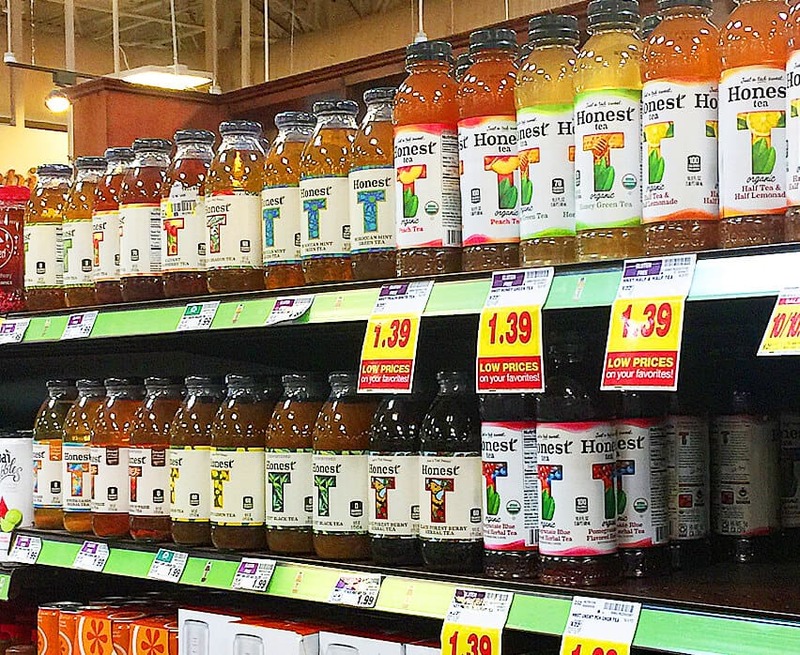 I found the Honest® Tea at my local Scottsdale, AZ Kroger banner store (Fry’s Marketplace) in the beverage aisle. If you hurry, there is a special offer until April 22, 2017 where you can get .25 off of 1 bottle using this coupon. However, the good news is that it can be used up to 5 times in one transaction at Kroger and all Kroger divisions. The spring rolls are made with rice papers dipped very briefly in water to soften. Then, they are filled with an array of fresh vegetables. The rice papers are easily found in the Asian section of any supermarket. I like to choose a rainbow of colors. Today, I went with cucumber, red cabbage, carrots, red and orange sweet peppers and Italian flat-leaf parsley. 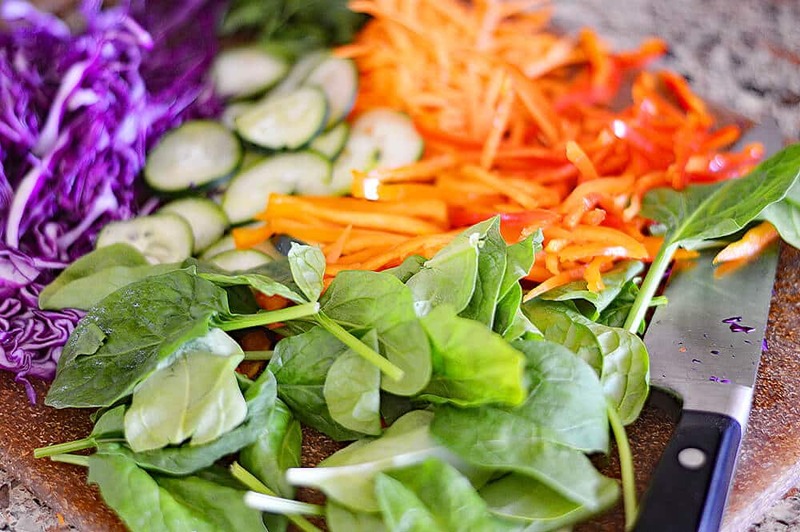 The veggies will be wrapped raw, so be sure to slice them into thin matchstick sized pieces. To assemble, you just stack your veggies into the center and fold in one end, then fold the two sides and roll. If you’ve ever made an egg roll, the same principles apply. Since the wrapper was softened in water, it will seal itself. The star of the show however, is the Peach Ginger dipping sauce and it could not be simpler. In a small pan over medium heat, add the Honest® Tea Unsweetened Peach Ginger Tea along with soy sauce (or Tamari), brown sugar and apple cider vinegar. I also combined the cornstarch with a bit of the Peach Ginger Tea separately to create a slurry. This slurry is what will thicken our sauce. Cornstarch works best when it is combined with the tea cold or at room temperature. You can then add it to your pan without risk of clumping. I’ve gotta tell you, the peach and ginger in the Honest® Tea came through so beautifully in this recipe. The flavors were distinct in both the taste and the aroma. I was really pleased with how it turned out. It was incredibly delicious. The fact that their product is Organic, Fair Trade and contains no added sugar are all bonuses in my book! If you know me, you know that I am big into recycling and green living. Some of my fellow bloggers have come up with really innovative ways to upcycle the Honest® Tea bottles including bird feeders and my personal favorite, a self-watering planter! You can click here for more inspiration including recipes like this one. Also, using the hashtags #HonestSustainabiliTEA #RefreshinglyHonest on all social media will help you to quickly and easily find their posts! Each time you purchase an Honest® Tea, you are helping to support the organic approach to agriculture. Learn how Honest® Tea is currently promoting sustainability here. Make the slurry by combining the cornstarch and 2 tbsp of tea. Set aside. In a small sauce pan, add the remaining dipping sauce ingredients over medium heat. Once hot, stir in the slurry mixture and cook for a few minutes until noticeably thickened. Remove from heat and set aside. Prep all of your vegetables ahead of time. 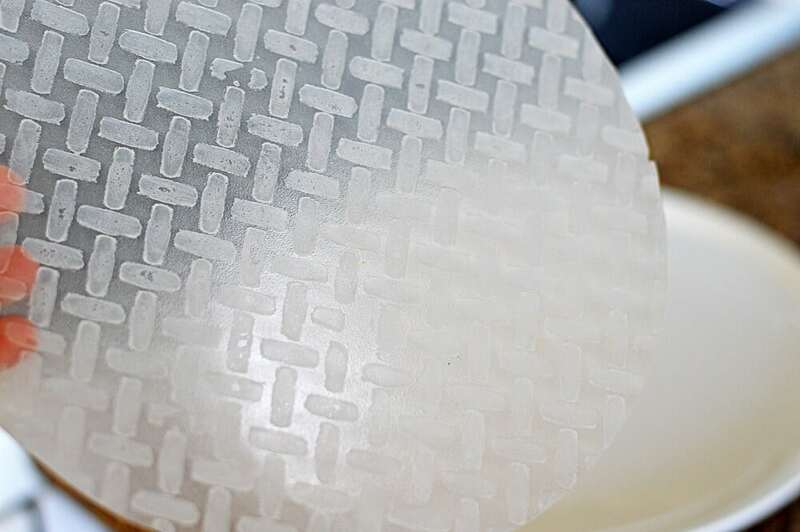 Prepare a plate with water in it large enough to acommodate the rice papers. Dip on paper at a time for a few seconds and place onto your surface to fill. 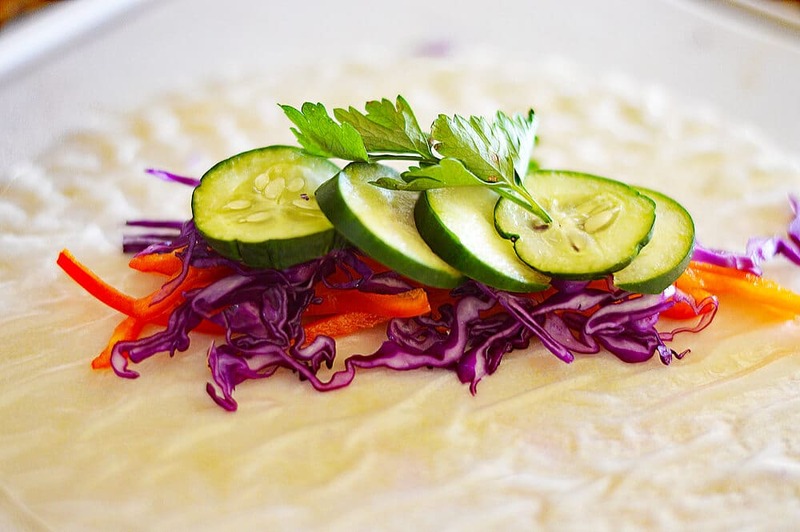 Place a bit of each ingredient into the center of the rice paper and carefully wrap like an egg roll. Once edge first, then both sides and finish rolling. It will seal itself. To serve, I like to cut a few of the rolls in half and sprinkle the dipping sauce with a few red pepper flakes. 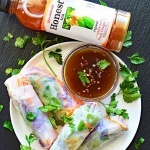 If you made this recipe for Vegetable Spring Rolls with Peach Ginger Dipping Sauce or if you’ve tried the Peach Ginger tea, let me know what you thought in the comments section below! Oh this looks absolutely delicious!!! The perfect light recipe for spring.